David Ripley was happy to see Northants lift their performance levels significantly as they secured their first win at Nottinghamshire in any competition since 2003. 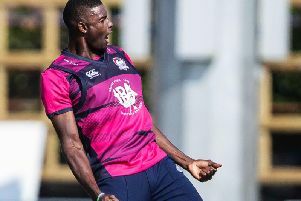 The County claimed a superb 49-run success at Welbeck Colliery, with Josh Cobb's 78 and Alex Wakely's 72 proving vital in the Royal London One-Day Cup encounter. Northants racked up an impressive 339 for nine and then bowled their hosts out for 290, with Graeme White (3-63) and Nathan Buck (2-70), on his return from injury, impressing. It was a first victory of the season for Ripley's men, who have lost three of their opening four County Championship matches and were beaten in their 50-over opener by Leicestershire. “I think it’s all about how we played today," Ripley said. "It was tight towards the end with 100 needed from the last 10 overs. That was doable because (Steven) Mullaney was playing well and we might have lost a tight game. "If we had lost, we would have still been a lot happier going home because it was the level of performance that was much improved today.